learn how to care for your lawn during the summer. Are your home and lawn ready for summer? With the weather heating up it’s time for outdoor activities, and you’ll want to make sure your lawn and yard are prepared. From fetch with the dog to tag with the kids after a barbeque, you’ll want to make sure you’re yard is ready for everything you throw at it. 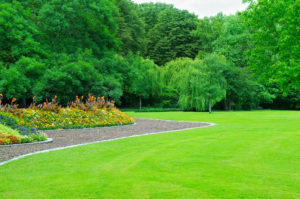 To help you get the lawn of your dreams checks out these three top tips for luscious green grass all season long. One of the best ways to keep your lawn in excellent condition make sure you start with proper mowing. Start by setting the blades of your lawn mower as high as possible. When grass is taller, it is better able to protect itself from the harsh light of summer sun, which means it will be able to retain moisture and stay greener. This is especially important during the hottest parts of the summer and if you live in a particularly dry area. You’ll also want to only mow in the morning or evening so that the heat of the day doesn’t have a chance to affect the freshly cut grass. While you might be tempted to rake up the grass clippings after you mow, for your best lawn ever you’ll want to leave them right where they are. Leaving the clippings will provide a light shade cover to your yard while also putting nutrients back into the soil as they decompose. If you want to add fertilizer, the best time is in the early spring or late fall. For a soft and beautiful lawn hydration is critical. While you may live in an area that gets enough natural rain, if you don’t you will want to add additional moisture. To make sure you’re getting the most out of your watering, make sure to only water early in the morning or later in the evening. This will ensure that as little water as possible evaporates with the heat. This entry was posted on Friday, June 1st, 2018 at 4:09 pm. Both comments and pings are currently closed.